Last year I connected with ThingLink and have had an opportunity to share interactive images with my students at Van Meter School. 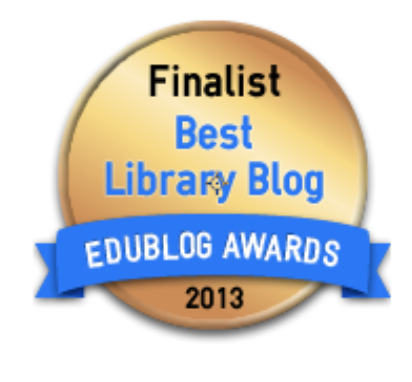 ThingLink is a wonderful application that lets teachers and students make images interactive. 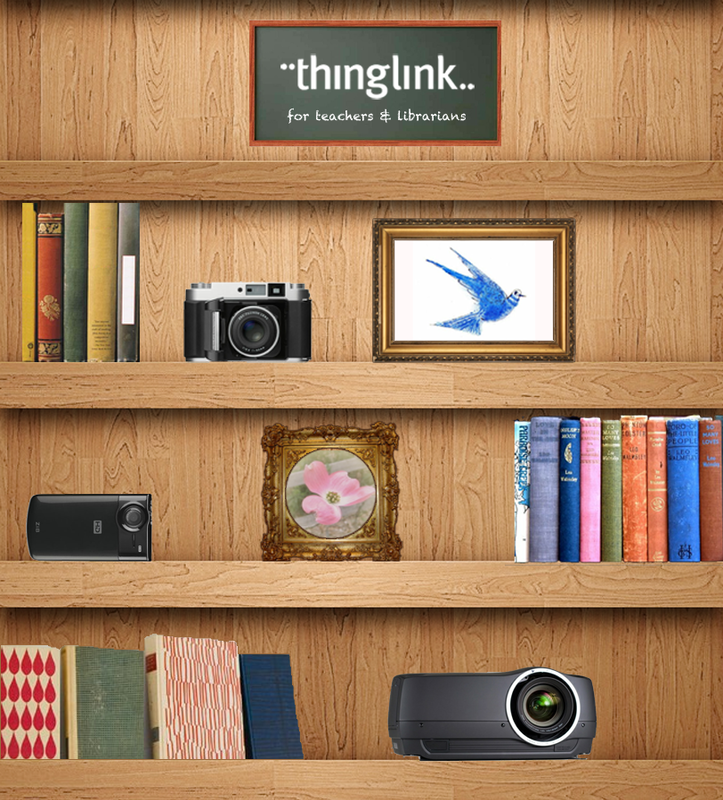 Last week I had a great conversation with Neil Vineberg, CMO of ThingLink. Neil filled me in on what was new at ThingLink and some amazing examples that others have created. 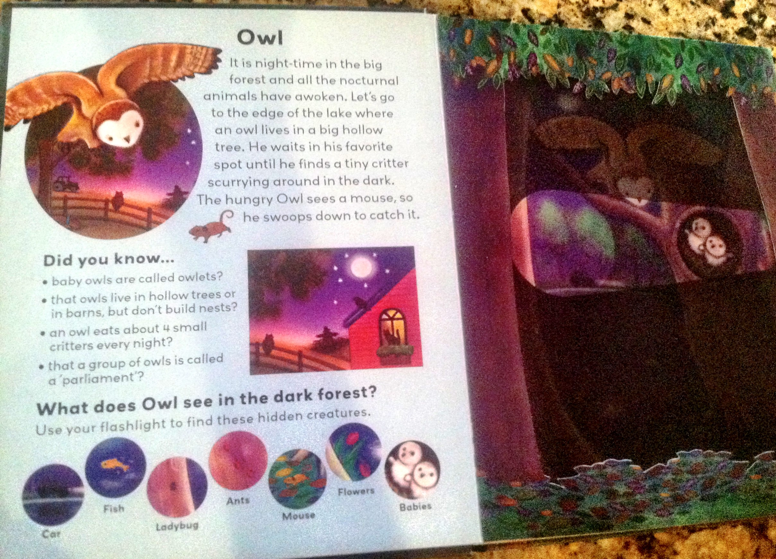 Interactive images help students develop 21st century learning skills and enrich their enthusiasm for learning. 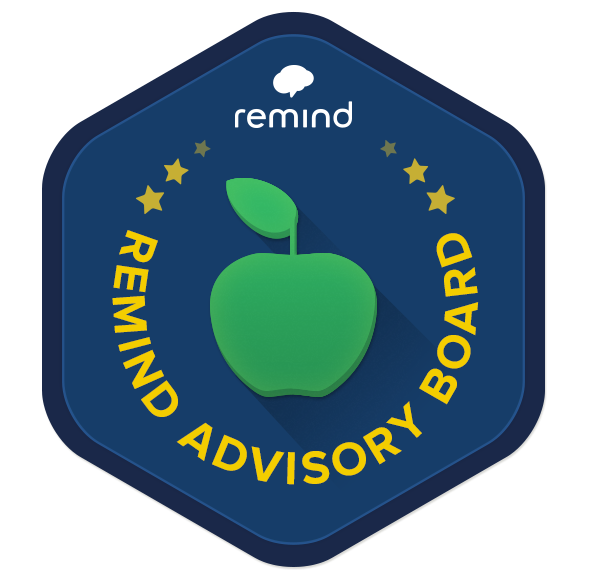 Teachers can use ThingLink to build interactive learning modules (ILM's) that activate and inspire students with creative and effective learning experiences. 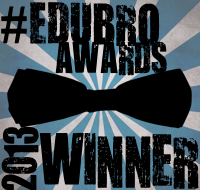 "21st century teaching is about interactivity and student engagement." He suggests that teachers need to "move from content-centered teaching to activity-centered and from teacher-centered to student-centered." 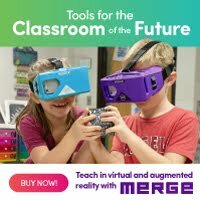 I agree, and think ThingLink is the most effective application I know for creating a fully interactive learning experience for students, and one that teachers and students can both easily create. 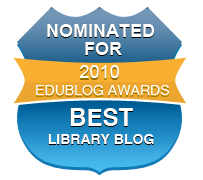 Creative rich interactive stories around historical events using media (video, sound, photos, written words, etc...) found online. 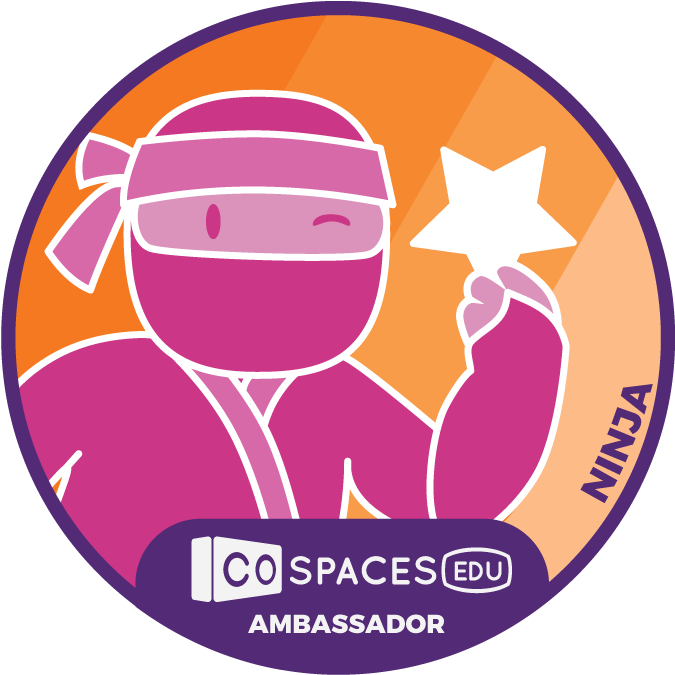 Record an instructional message to students inside an image. 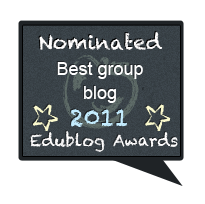 Embed interactive images into student blogs. 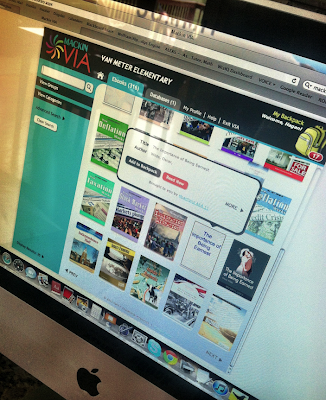 Enable students to curate content inside an image to demonstrate understanding of a topic. 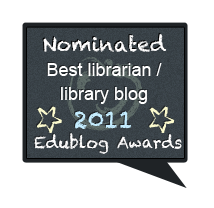 To learn more about ThingLink, click on this link and hover your mouse over the interactive image. 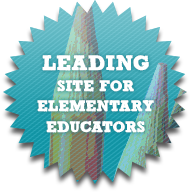 There are links to interesting content developed by teachers from across the globe. 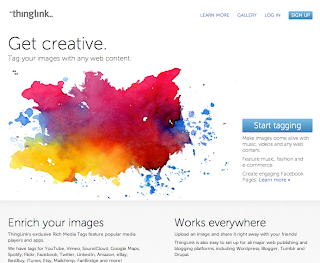 To sign up for a free account, visit the ThingLink website. 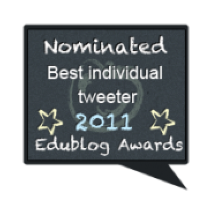 You can also view more examples in the ThingLink Gallery. 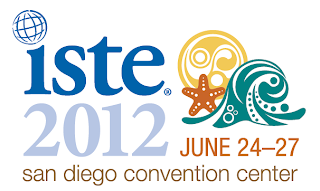 ThingLink will be exhibiting at ISTE (Booth 2134) and I'll be meeting with their team to share ideas. 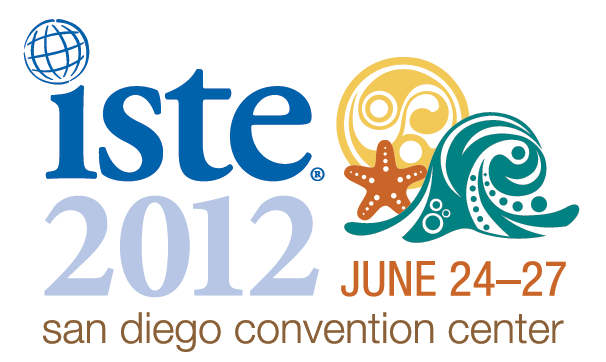 If you are attending, stop by their booth to say HI! You can contact Neil Vineberg at neil@thinglink.com for more information as well. What a FUN way to spend a day in the summer....at the Blank Park Zoo! It has always been one of my favorite things to do with my little people. 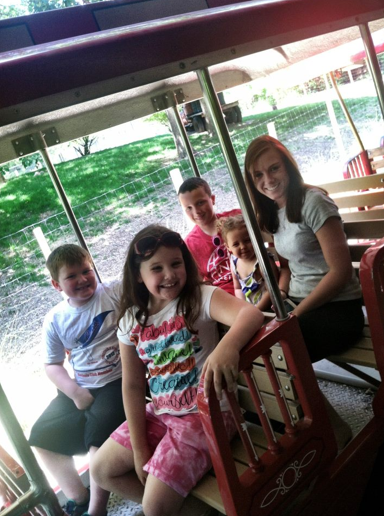 Last week, we went to the zoo for the day. When we were leaving, I saw my friend Mallory Machir. She graduated from Van Meter School a few years ago and is now an Animal Presenter at the Blank Park Zoo. 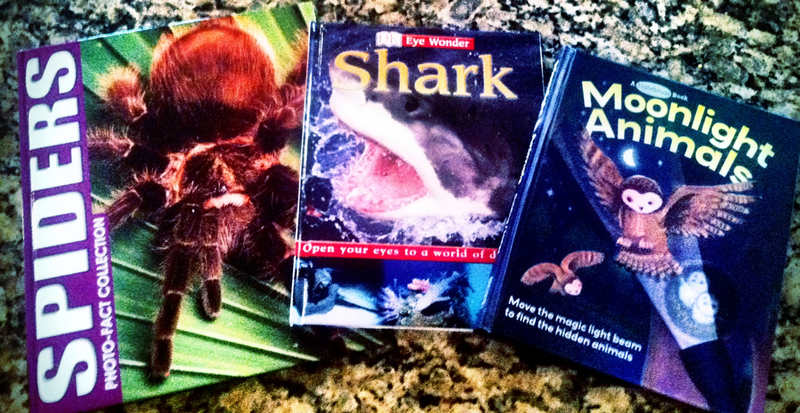 Mallory was telling me that she just had returned from visiting a public library with a few animals. 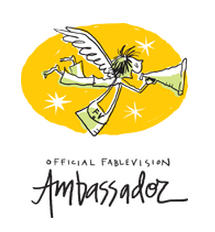 I was so excited to hear about this program and asked her to send me more information. As we left the zoo, I thought of all kinds of ideas on how we could incorporate a zoo animal visit into the Van Meter Public Library Summer Reading Program and the Van Meter School Summer Reading eBook Program! 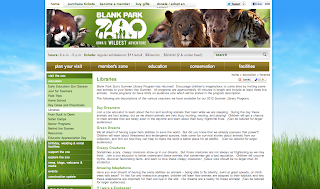 The Blank Park Zoo Summer Library Programs "encourages children's imaginations to come alive by inviting some real zoo animals to the library this summer." 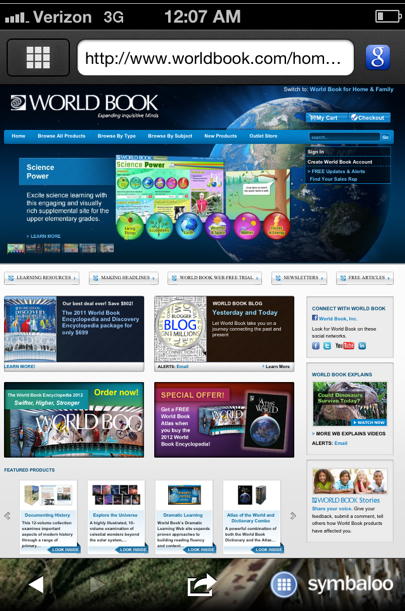 There are several different programs that you can choose from on the website. I thought the "Show and Tell" program sounded perfect. When I spoke with Samantha Dunn, who is in charge of the Summer Library Program, she agreed and helped me pick four animals from the zoo would be visiting our public library. We decided on an owl, baby alligator, ferret, and tarantula. If they are having an off-day, then we might have a turtle or a gecko instead. On July 3rd at 2:00pm, Mallory and the animals will be visiting the public library in Van Meter. 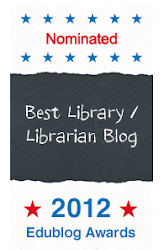 The kids who have been participating in the summer reading programs and others will be so excited. When I visited Jolena and Vickie at the library this afternoon, we talked about getting a few books and eBooks about the zoo animals that would be visiting. 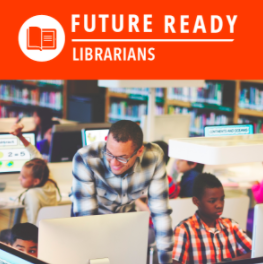 This would be the perfect connection to both summer library programs. And it would also encourage them to read more while learning so many amazing facts. 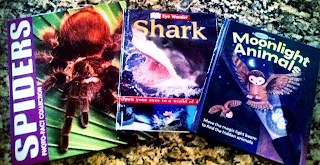 Riley, my niece, Hagan, Brianna and I visited Barnes & Noble this afternoon and found three new books about the zoo animals that will be coming to the library. 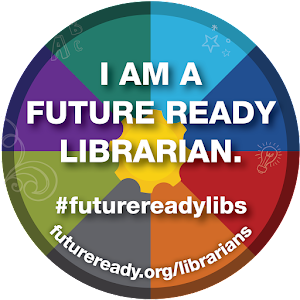 I will take these down to the public library tomorrow so all of the kids can look at them when they are visiting the library over the next few weeks. 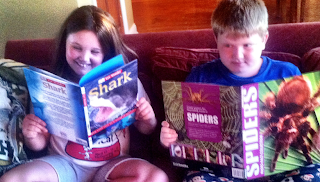 And having the animals visit the library is also a GREAT connection to the nonfiction eBooks we have in our collection and to the Summer eBook Reading Program we are doing through the school library. 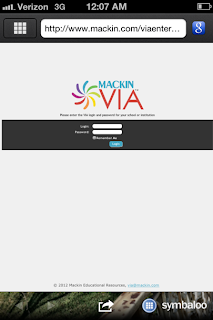 Today, I ordered several new eBooks to add to our Mackin VIA so all of the kids can read and learn about the different zoo animals coming to visit. 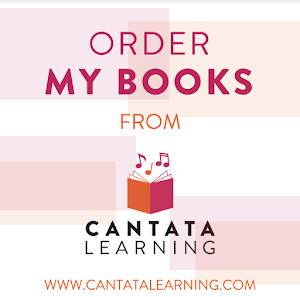 These eBooks can be viewed simultaneously, 24/7 from various devices and platforms. 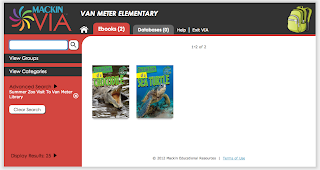 I created a new Group within VIA called "Summer Zoo Visit to the Van Meter Library" and found two eBooks we currently have that contained a few things about alligators and turtles. 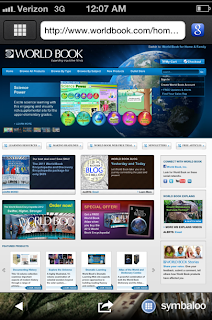 The new eBooks will also go into this Group. Jolena, Vickie and I are going to have a blast encouraging and promoting the kids in Van Meter to take in all they can about the zoo animals before they come to our town. They will also be able to record this time reading in the print book and eBooks on their summer reading logs. 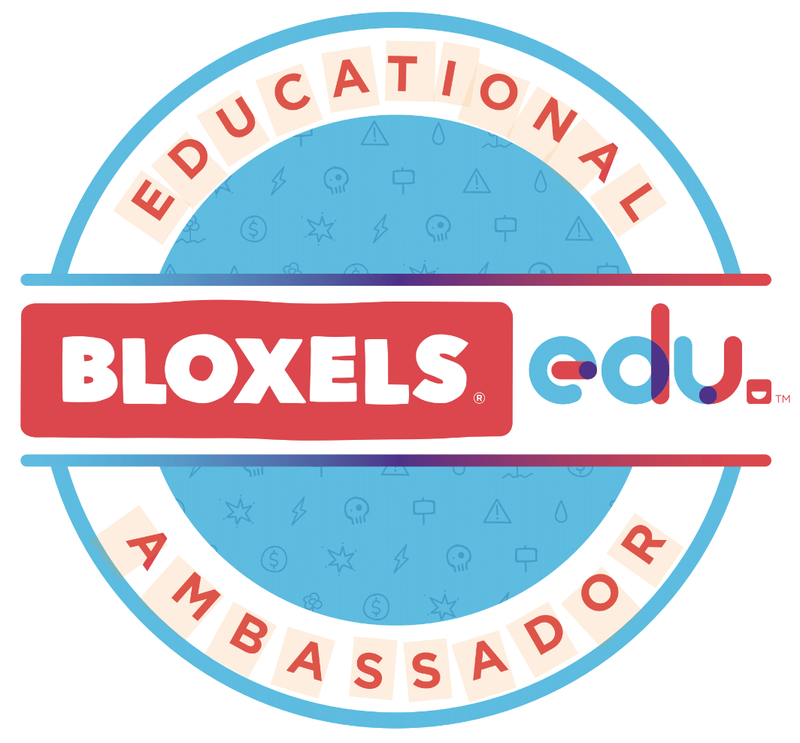 It is going to be an exciting month! 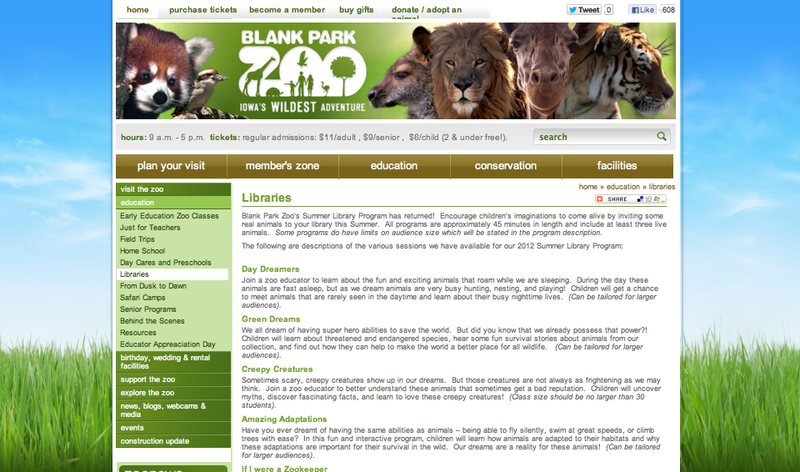 I can't wait to learn more about the zoo animals! And what a fun way to have the zoo come to us for a day, too. Is Your Inbox A Mess? 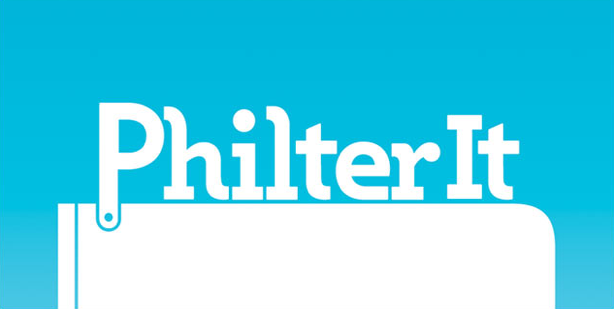 Try PhilterIt...A New Way To Email! 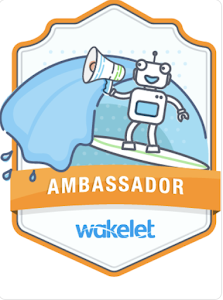 Last week my friend Natan Edelsburg, from Sawhouse Media and The Shorty Awards, wrote me about his friend Robert Wollner who has developed, along with his business partner Avi Levine, a new email platform called PhilterIt. Natan connected Robert and I in an email. The next day Robert and I had a wonderful talk about his exciting new adventure with PhilterIt and how it came to be. When I asked Robert what inspired him to develop PhilterIt he shared a great story from his childhood about growing up with a Couponer and how he relies on emails for deals and promotions today. With all of these emails though it can quickly get out of control. 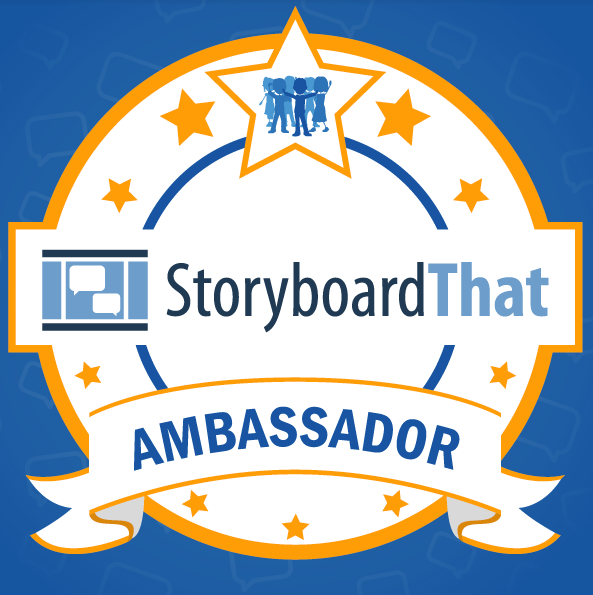 Robert wrote, I tried to created filters, but I quickly realized that for each filter I set up, it seemed like there were three more brands that popped-up and needed to be dealt with. What is Philterit? 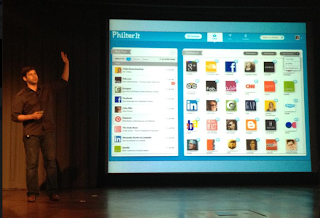 PhilterIt.com is a visual inbox that allows users to prioritize the brands and people they care about the most. Unlike a number of the other solutions out there, we have created a simple interface that lets the user filter tens of thousands of brands....social, deals, commerce, newsletter...and seamlessly. PhilterIt Summary... PhilterIt.com is changing the way users experience email. Our inbox is perfect for heavy online shoppers and daily-deal seekers who are overwhelmed by the emails they receive from brands but don't want to lose the valuable content. 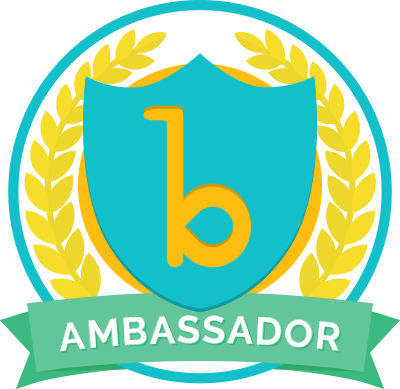 We filter brand messages into icons, so that they are out of the way but not lost. PhilterIt is elegant, beautiful and simple to use. Email is getting a makeover. As Robert and I spoke about PhilterIt and email, I had a great time learning how to set up my own PhilterIt email. I really like how emails can be searched by "All, Personal, and Brand" emails within the Mail Feed on the left-hand side. I loved setting up my Dashboard with a few icons. I picked icons of my favorite social networks like Facebook, Twitter and LinkedIn. 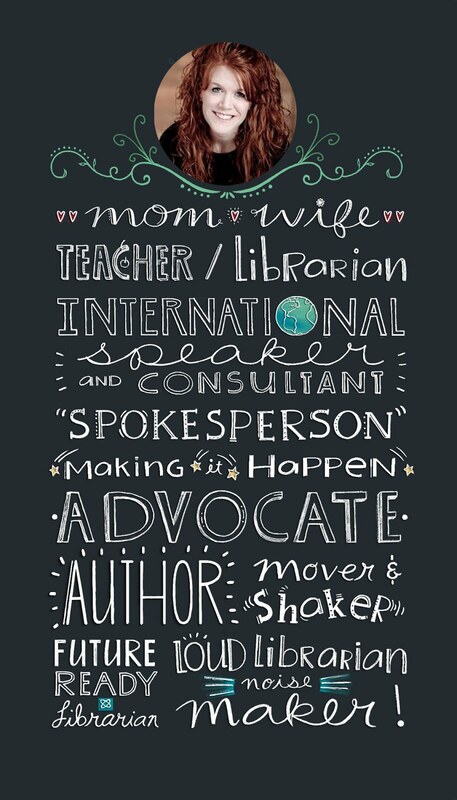 I also created icons for my daughter, my mom, my teaching job and a few other companies and groups that I am associated with. It was easy...I just needed the email address and an image to create the icons. I even moved the icons around the way I liked them on my dashboard. I usually get over 200 emails in one day. It is hard to keep up with and sometimes I can't even get to all of them on the day they make it to my inbox. With PhilterIt, I now have my two emails that I use the most together in one place and I am much more organized with all of my emails. I know you will like PhilterIt just as much as me so give it a try. 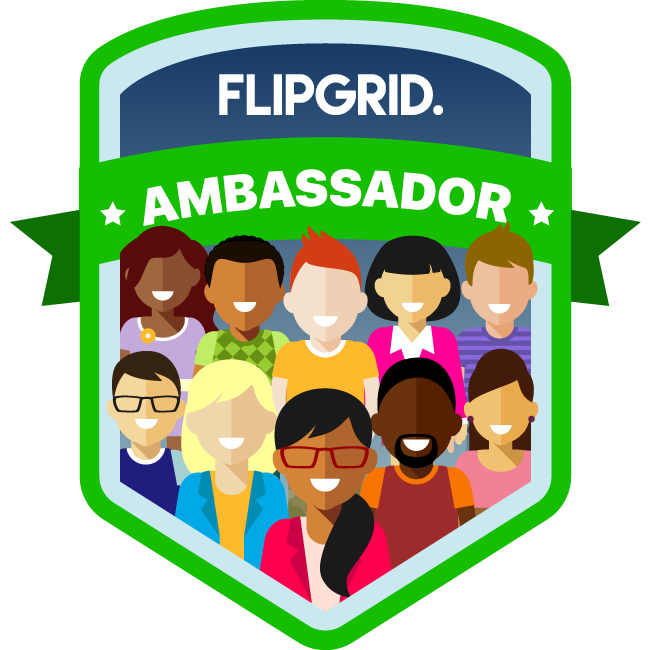 Robert gave me an Invitation Code to share with my friends and followers. When you go to PhilterIt's sign up page, register by using your email, password and the invitation code VOICE. 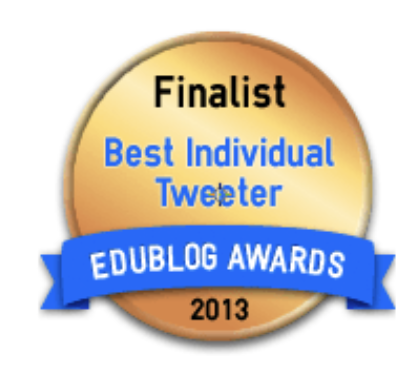 PhilterIt is definitely something I will continue to use and share. It will help me stay organized, not miss important emails, and I will be able to see the emails I want to see first everyday. 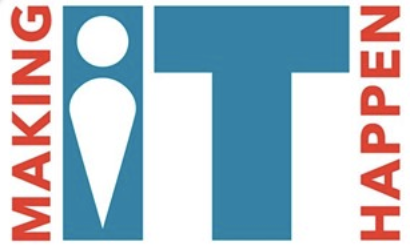 You can find PhilterIt on Facebook and Twitter @PhilterIt! Here are two great articles about PhilterIt in TechCocktail....What's Your Email Personality Type? 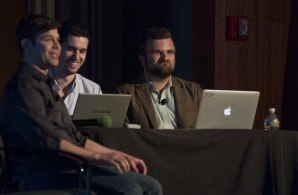 and Technori May 2012 Technori Pitch Recap. Today, the New York Times Learning Network promoted reading through their amazing event on Twitter called #SummerReading. 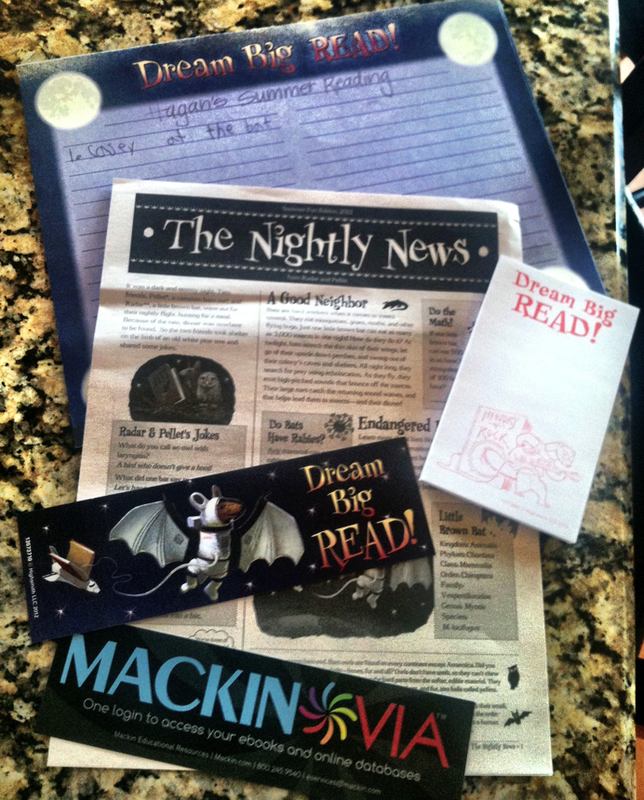 I wrote about this reading promotion on my blog, Give A Shout Out for Summer Reading on June 7th! 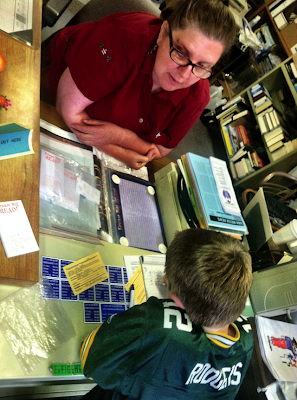 My son Hagan and I celebrated #SummerReading by making a little trip to the Van Meter Public Library. The summer reading theme at the Van Meter Public Library is "Dream Big READ!" Hagan got lots of fun bookmarks, notepads, a newsletter and reading log to record his reading. Jolena, the Van Meter Library director, and Vickie, the assistant library director, loved seeing Hagan at the library today. Jolena told him all about the #SummerReading program and what he needed to do to participate. Hagan signed up on the sheet where all of the other little people in Van Meter did over the weekend at the #SummerReading kickoff. 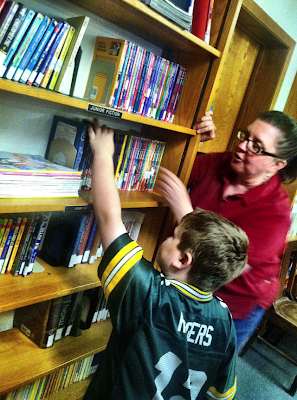 Jolena showed Hagan the different areas of the library where Hagan could find books that were his reading level and interesting to him. He told her he wanted to read books about baseball and sports over the summer, so they found a lot of those. 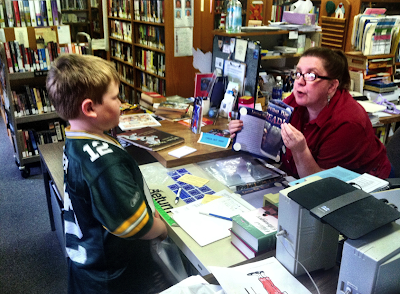 Jolena told us that a lot of the Van Meter students were coming to the library and reading eBooks in Mackin VIA for their #SummerReading. We saw the MackinVIA QR code poster hanging up so everyone could find the eBooks easily. 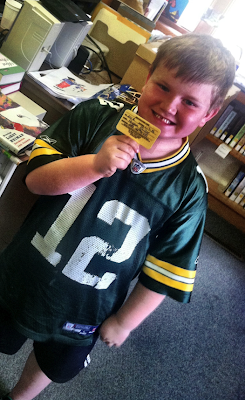 Three baseball books and three baseball movies later, Hagan was ready to use his library card to check out. 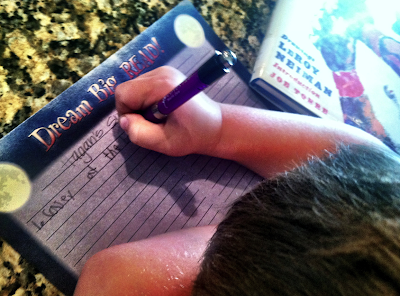 When we got home, Hagan did a little #SummerReading outside and then wrote down that he read Casey at the Bat by Leroy Neiman. 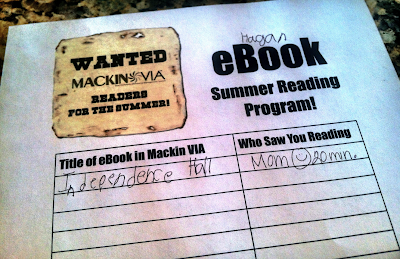 After that, Hagan wanted to read an eBook for the #SummerReading contest we are having at school. 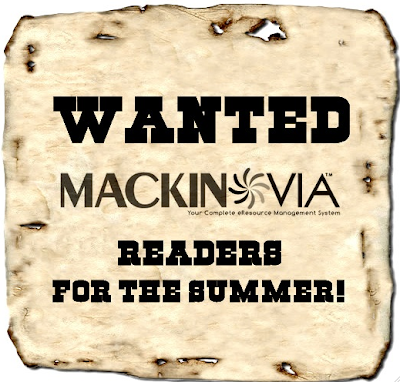 You can read all about it in my post called, Wanted....Readers for the Summer in Mackin VIA! 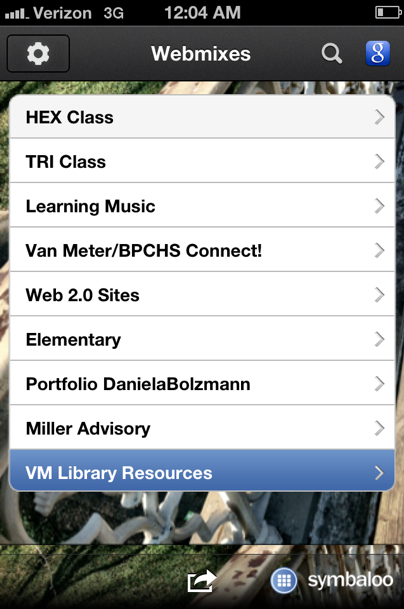 Hagan logged into Van Meter's Mackin VIA and then into his Backpack. He already has several eBooks in his backpack but found a few more to add today. 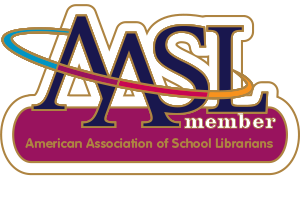 Once he added the eBooks, he looked through his little Backpack collection and decided to read Independence Hall, which is part of the Symbols of American Freedom series. After Hagan read the eBook for awhile and learned lots of new things, he wrote the title down on his eBook Summer Reading Program log. Today, my niece Riley came to visit for a week. 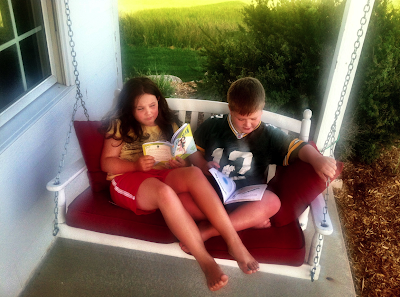 Riley and Hagan went outside and found a peaceful place to read. 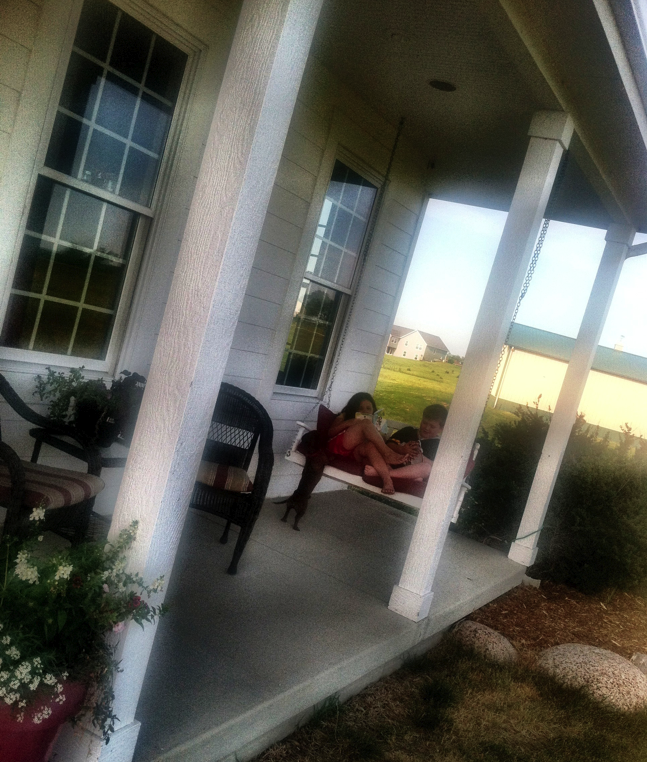 It is going to be a wonderful summer and one that is GREAT for #SummerReading. 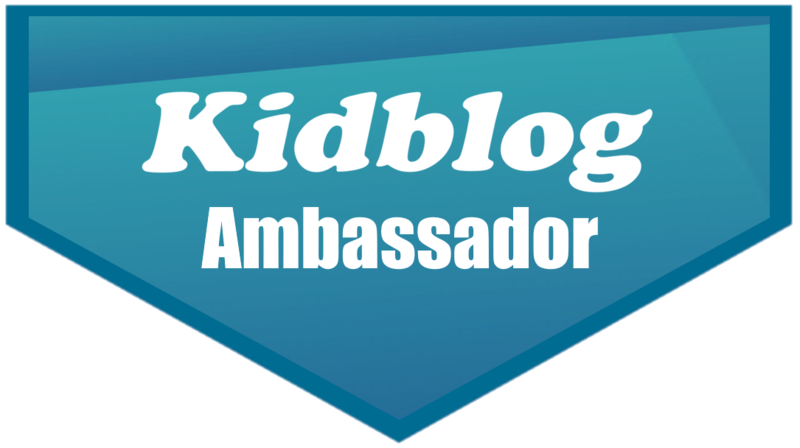 Love These TWO New Kid Bloggers! I have three nieces....Riley, Grayce, and Zoey. Riley and Grayce are two of my little besties. When I see them we talk about all kinds of things they have done since the last time I saw them. When we celebrated my sister Heather's birthday last night, they couldn't wait to fill me in about the end of their school year and plans for the summer. Riley showed me her journal and was very proud of everything she wrote. 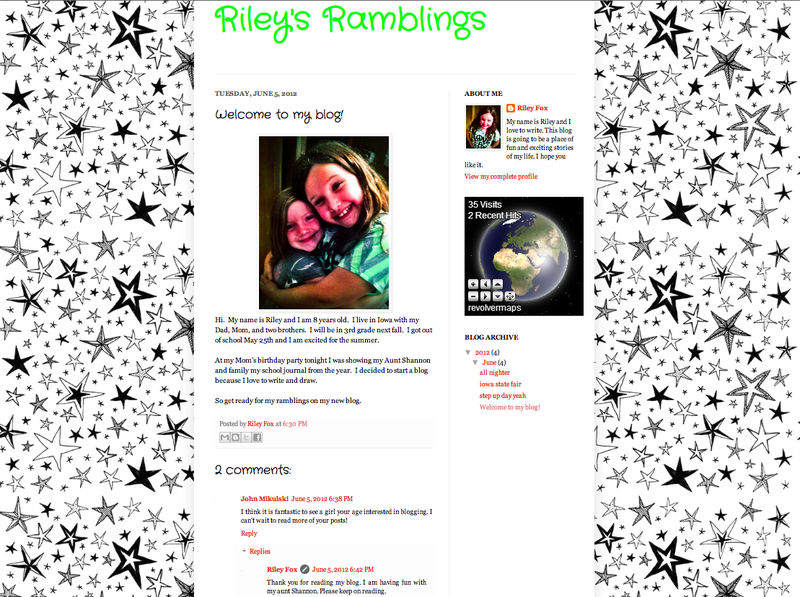 I told her that she should turn her journal into a blog....she LOVED the idea. And of course....Grayce wanted a blog too. 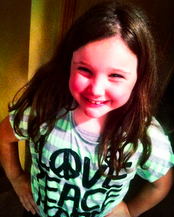 Riley is 8 years old and just finished 2nd grader. She loves writing and is an amazing artist. 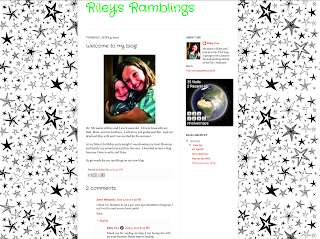 Riley called her blog Riley's Ramblings. Today, Riley is going to start her very own Twitter today too! 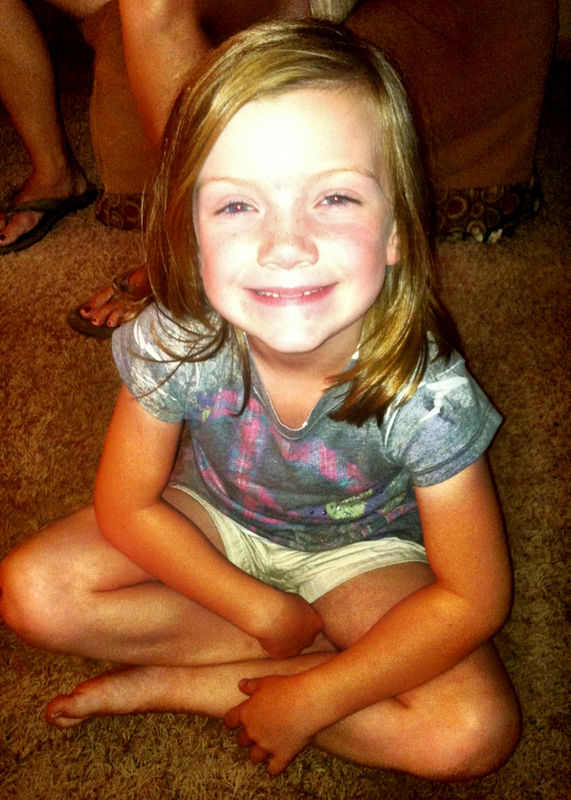 Little Grayce is 6 years old and just finished 1st grade. She LOVES the same things Riley and I do...writing and art! 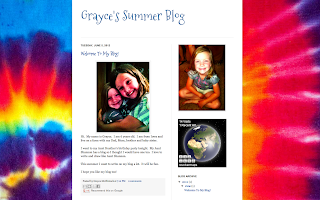 Her blog is called Grayce's Summer Blog. I cannot wait to see what the two of them write and create this summer. 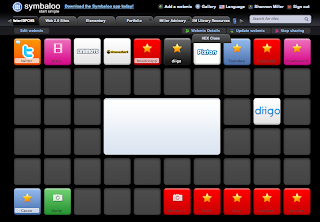 Symbaloo...A FUN Way To Search, Bookmark, and Share Your Favorite Sites! 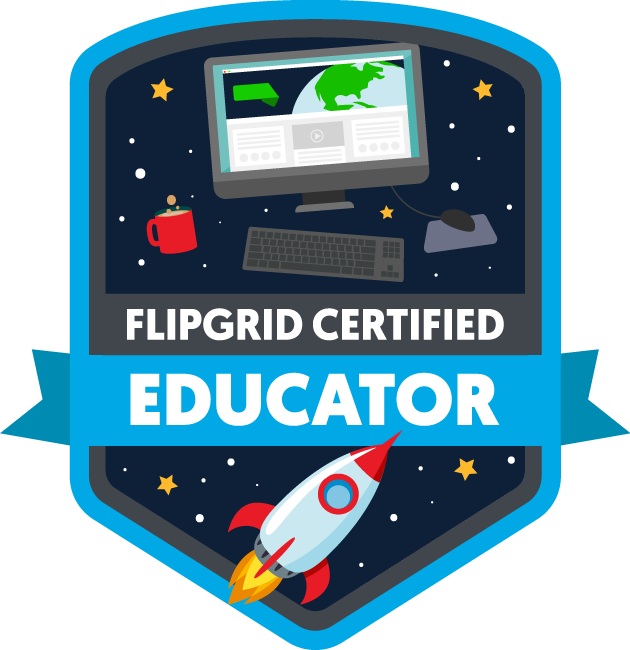 Ever since I learned about Symbaloo a few years ago, it has been one of my favorite websites to use and share with teachers, students and friends. It is not only the most visual way to bookmark sites, Symbaloo is the perfect opening page for any computer. As the Symbaloo website states, "Symbaloo is a new way to organize, share your online life and discover that of others." 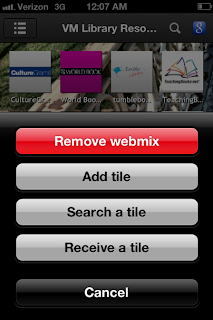 Within Symbaloo, you create "Webmixes", which are pages of bookmarked sites placed into "Tiles". You can have multiple webmixes within your Symbaloo account. The "tiles" are created by choosing websites that you want to include in your webmix. 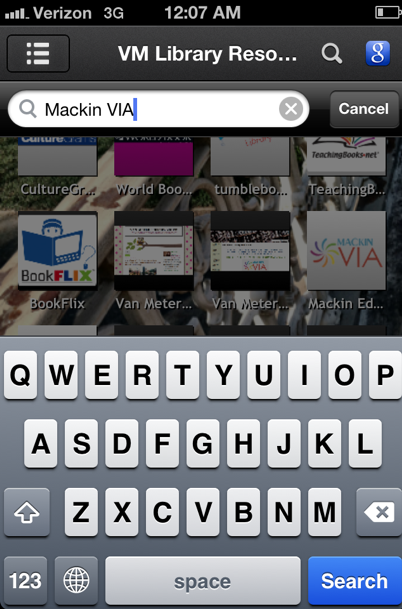 You can search tiles that you would like to add and also create your own by adding the url, text and image to a tile. 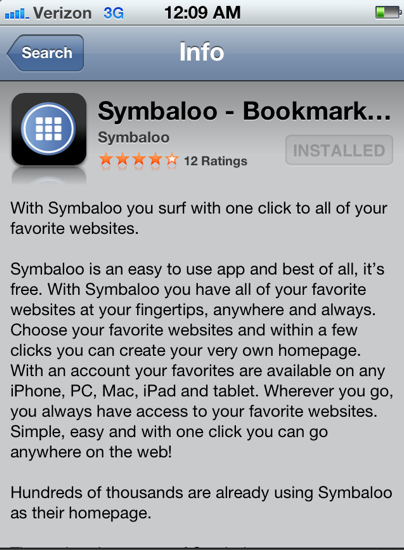 Yesterday something very exciting happened for Symbaloo!!!! 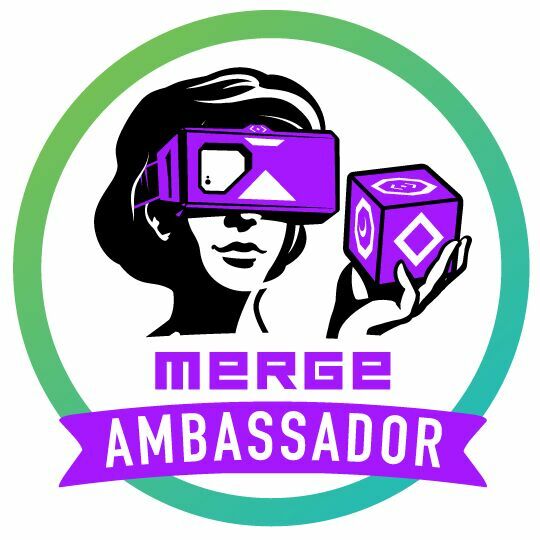 The Symbaloo app became available! And "WOW", is it awesome! Once you are logged into your Symbaloo account on the app, you can see all of your webmixes and click on the one that you want to view. I even changed the background and put in a photo I took in Central Park this last spring. 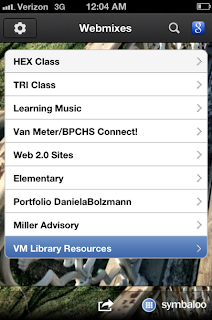 I clicked on my VM Library Resources webmix. I really like how each tile is labeled below the image as well. 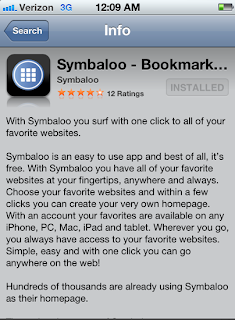 This will be helpful especially to little people as they use the Symbaloo app. 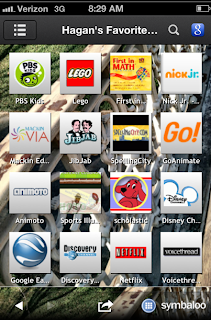 I clicked on a few of the tiles and the websites popped up quickly within Symbaloo. It is also very easy to add and search for tiles from the app. 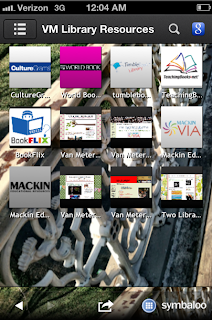 I wanted to add Mackin VIA to my library resources webmix. 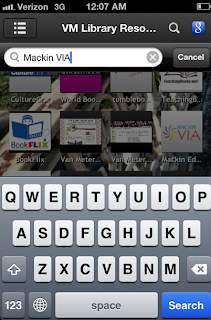 I typed in "Mackin VIA" within the search box at the top of the screen. 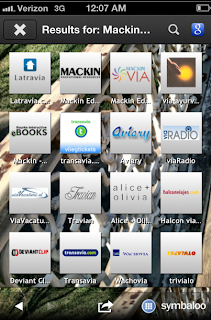 It gave me several tiles that I could choose from, including Mackin VIA and the homepage for Mackin as well. 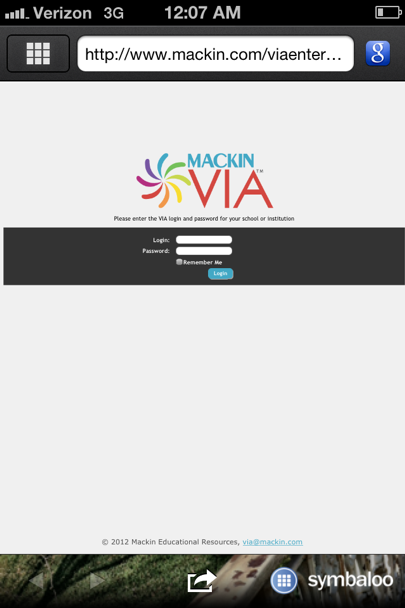 Once I added the Mackin VIA tile to my webmix, I was able to go right to the website. This will be another way that students, teachers and parents can view our eBook collection within Van Meter's Mackin VIA. 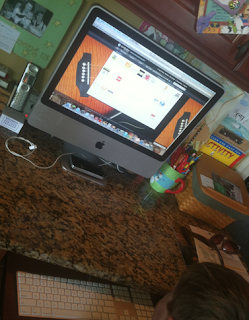 This morning, my son Hagan and I set up a new webmix called Hagan's Favorite Sites. After I showed Hagan how to click on a new tile and search for the website that he wanted to add, he was able to do it all by himself. I did have to help him with a few that needed to be created, like this tile for Hagan's Diigo List. 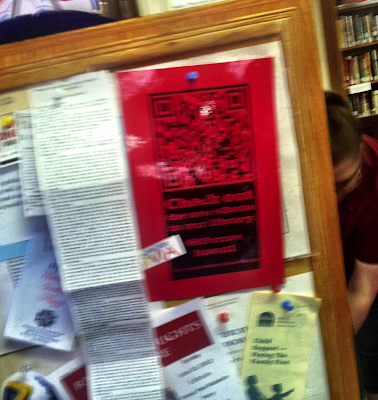 We got the url for his Diigo List and then found a photograph he wanted to use. 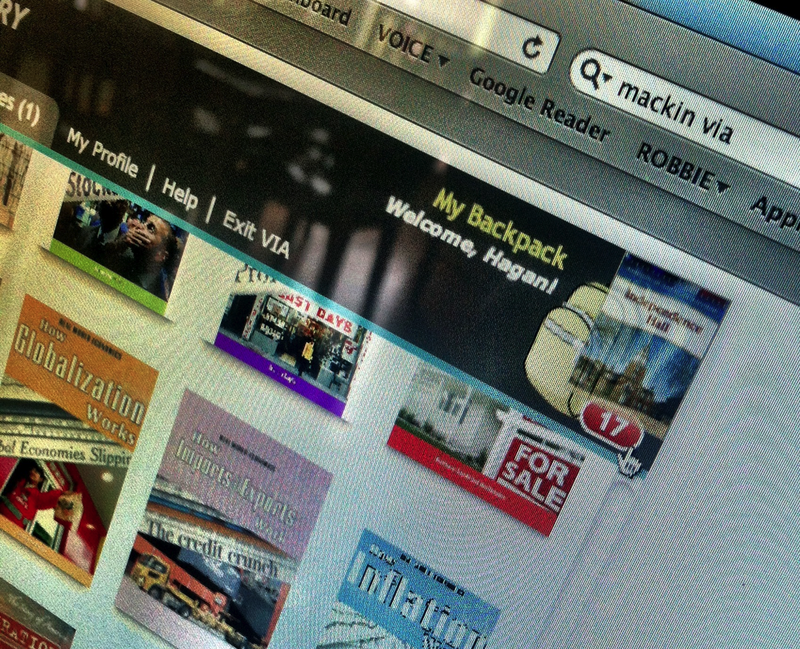 When Hagan had several of his favorite websites in his webmix, he tried a few out. 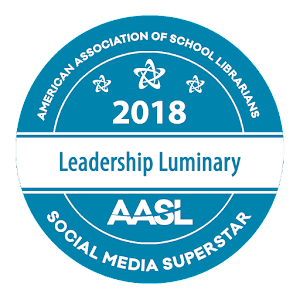 He checked out Sports Illustrated Kids and even read one of his favorite eBooks from his Backpack within Mackin VIA called Can An Old Dog Learn New Tricks? 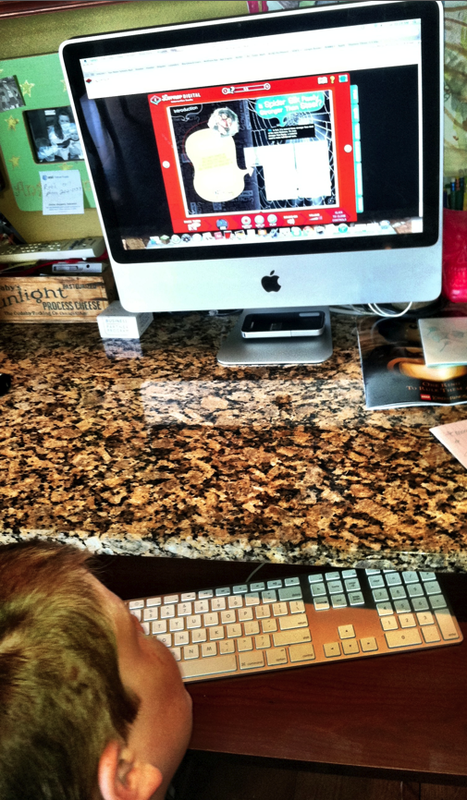 He was excited when I showed him the app on my iPhone too and added a few more tiles there as well. After I showed it to him on my iPhone, he ran upstairs and got his iTouch to add the Symbaloo app for our road trip this afternoon to Aunt Heather's house. Now he will have all of his favorite websites with him all the time. It is so nice how Symbaloo provides the html code for each webmix so they can be embedded into blogs, websites, wikis, and more. The webmix embedded above is Hagan's and the tiles can be clicked on even in this post. 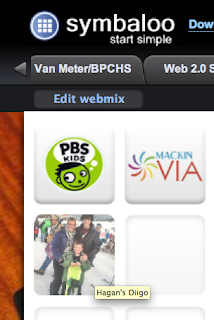 It is also fun how you can share your webmixes through Facebook and Twitter. 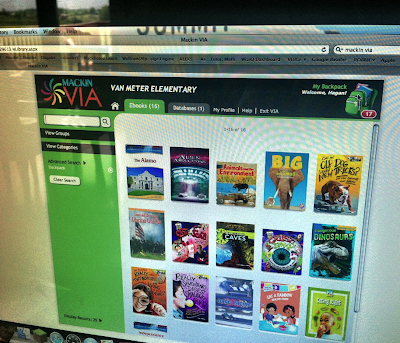 I will be sharing lots of different webmixes on the Van Meter Library Voice Facebook page. It is the start of summer and just the right time to try out something new! So checkout the Symbaloo app and website! 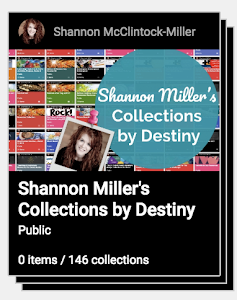 One more great way to search, organize and share the web! Give A SHOUT OUT For Summer Reading on June 7th!